Create Fun-Filled Memories With Tomi Kite! Coming in at a giant 60 inches wide and 32 inches long with 6 100-inch tails, this big kite with bright rainbow colors flies easily and looks spectacular against the blue sky. It also boasts a large 600D handle and a non-rip 100 M string that allows anyone - kid, adult, beginner, professional - to fly it as high as they want. Most importantly, they'll have fun and create memories of guiding their dancing kite across the sky. Ready to get your kids - or yourself - away from the TV and outside for some fun? Get this rainbow kite today. It comes with a lifetime warranty and a full money-back guarantee. So don't delay, order now while supplies last. 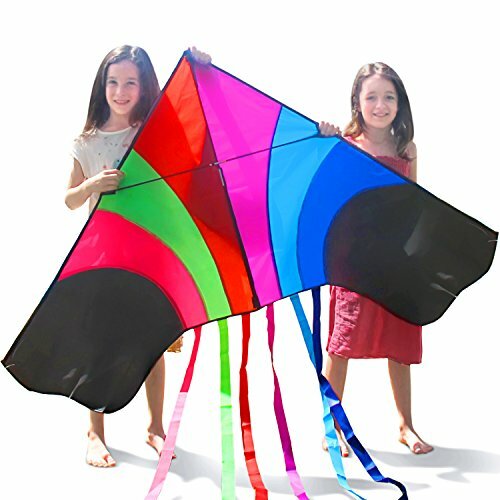 CREATE MEMORIES - Your children will have the time of their lives flying this unique kite with you! This delta kite comes with a long line, is easy to fly and its rainbow colors look spectacular against the blue sky. BUILT TO LAST - This colorful kite is made from the highest quality materials, including weather-resistant rip-stop fabric and strong, flexible fiberglass rods with extra reinforcement! GET ACTIVE - Tired of kids sitting around playing video games or watching TV? Flying a kite is a fun activity that builds coordination, strength and critical thinking. For example, kids will run to launch and recover the beautiful kite! EASY TO FLY - Whether you are at the park, the beach, in a field or anywhere else, Tomi Kite is super easy to fly for both girls and boys, kids and adults. This kite is truly for everyone. It's stable in the air and easy to launch. GO FLY A KITE - Comes in an easy-to-store all-in-one 18-inch pack that includes an easy-to-follow owner's manual. This is the ultimate children's kite set! Plus, it comes with a lifetime warranty and money-back guarantee. Get yours today! If you have any questions about this product by Tomi Toys, contact us by completing and submitting the form below. If you are looking for a specif part number, please include it with your message.